Turning is one of the most important metal machining processes besides milling and grinding. Especially rotational symmetrical parts are usually turned as this is the first choice in terms of high productivity and high accuracy. Nevertheless turning has some disadvantages like a limited geometrical flexibility and high tool wear, especially when it comes to machining of difficult to machine materials.§In this work a novel turning process is developed, namely simultaneous three axis turning, where the tool is moved in a third rotational (B) axis besides the already existing translational (X, Z) axes. This additional movement is realized by the integration of the already existing but yet unused B-axis of turn-/mill or mill-/turn centers into the turning process. 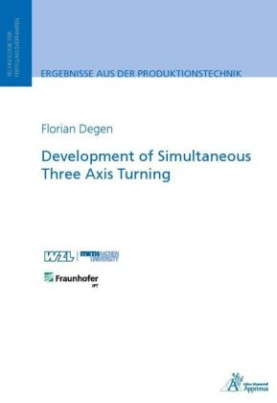 By this the geometrical flexibility of turning can be increased and the tool consumption can be decreased significantly.§It is investigated how simultaneous three axis turning can be realized with state of the art machine tools such as turn-/mill centers or mill-/turn centers. In addition it is investigated which effect the additional tool movement has on the target values like the uncut chip geometry, the process force, the tool wear, the workpiece surface and the chip flow. Besides that models are developed to predict the effect of the additional tool rotation on the named target values. By those models it is possible to calculate the uncut chip parameters, the process force components, the chip flow angles, the tool wear development and the tool wear distribution for simultaneous three axis turning, but also for conventional two axis turning.§Based on the turning experiments and on the models, design rules are deduced which can be used for a basic process layout of simultaneous three axis turning. In addition a process design method is developed which guides step-wise through the different phases of the process design. By that it is possible to design simultaneous three axis turning processes systematically and efficiently for arbitrary workpieces in industrial production.